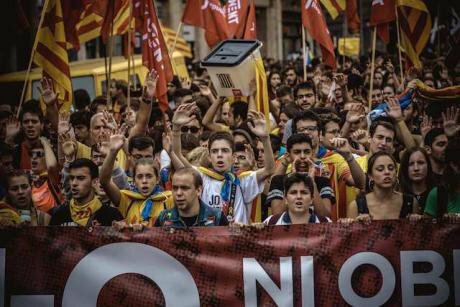 Striking Catalan pro-independence students march through Barcelona on the Catalan Secession referendum anniversary, October 1, 2018. Matthias Oesterle/Press Association. All rights reserved. In order to fully understand the Spanish government’s over-reaction, we need to grasp precisely what happened following the transition from the dictatorship. The Spanish transition was in many ways unique to Europe. Of the countries that were under the iron heel of fascism in the twentieth century (Germany, Italy, Greece and Portugal and Spain) only Spain deserves the description ‘postfascist.’ Italy and Germany passed through different processes of cleansing fascism from government in the post-war settlement; Greece and Portugal were exposed to processes of reparation, memory and indeed criminal trials that helped expel fascism from the establishment. This was not the case in Spain. It is Franco’s nationalist flag, not the republican tricolour that remains the Spanish flag. Spain’s national day is October 12, the anniversary of the arrival of Christopher Columbus in the Americas. This is Franco’s “day of the race” that explicitly celebrates the conquistador traditions of Spain and remains closely bound to a colonial, anti-republican nationalism. The ongoing public funding of the Franco Foundation, the preservation of the Duchy of Franco (a hereditary title gifted to the Franco family by King Juan Carlos), the statues of the Dictator in public places and the streets named after him, are all examples of the cultural endurance of the emblems of fascism at the heart of the Spanish aristocracy and the Spanish state. When Juan Carlos’ son Felipe made an unprecedented TV address on October 3 last year, his explicit condemnation of Catalonia and its institutions for their disloyalty opened the political space for the constitutional suspension of the Catalonia government. The Spanish government’s tough clampdown in Catalonia is justified exclusively on its opposition to Spanish statehood and the monarchy. And this explains the dramatic punitive turn against any insubordination shown to the monarchy in Spain. The rapper Valtonyc was forced to flee into exile to Brussels to avoid a possible three years of imprisonment for his anti-royalist lyrics. Another hip hop singer, Pablo Hasel, is currently facing trial for ‘hate speech’ against the monarchy. The intolerance of insubordination has significantly intensified since the October 1 referendum. A major art exhibition on “Contemporary Spanish Political Prisoners” by the artist Santiago Sierra was banned and removed by the authorities in Madrid earlier this year. The spectacle of police confiscating yellow banners, ribbons and balloons from football fans and the banning of the use of the colour yellow by human rights activists is perhaps one of the most extreme and preposterous manifestations of the state’s complete pulverisation of any discussion of the political prisoners. Indeed, because the ’78 regime enabled Franco’s elites to consolidate their power and then expand through a combination of post-Franco privatisation and the preservation of close links to the ruling parties, particularly the PP, corruption can be said to be integral to the postfascist oligarchy. Moreover, it was the unavoidable fact that corruption is integral to the regime that eventually brought down the Rajoy government on May 31, 2018. The 1977 ‘Amnesty Law’ gave an official amnesty to Franco’s political prisoners at the same time as granting impunity for crimes related to the regime. Civil servants who played a key role in the Franco dictatorship, judges and police officers – including those who had tortured countless civilians – quietly remained in place under the terms of the post-Franco amnesty. This continuity of personnel, coupled to the institutional amnesia about Franco’s mass graves – Spain had the second largest number of ‘dissappeared’ in the twentieth century after Cambodia – ensured that the institutional culture of fascism went unchallenged inside the state. The ease with which Spain convicts political prisoners and forces politicians into exile is a mark of the endurance of the culture of the dictatorship in which the judiciary were politically motivated and politically compromised. The crime of rebellion used by Rajoy, and the current government to detain political prisoners was a nineteenth century offence, brought back by Franco in the 1940s to prosecute and execute thousands of opponents using his military courts. We are not claiming that the practice of imprisoning political opponents and forcing people into exile remotely resembles the scale of violence experienced in the Franco period. But it is crystal clear that this practice reflects the modus operandi of the dictatorship very precisely. This is certainly not fascism either in its official guise, or in practice. But it is post-fascism. And it is the post-fascist structure of power that explains why the independence movement in Catalonia is not going to be broken easily.